Wilton Non-Stick Deluxe Baking Set!! HOTT!! Love to bake? 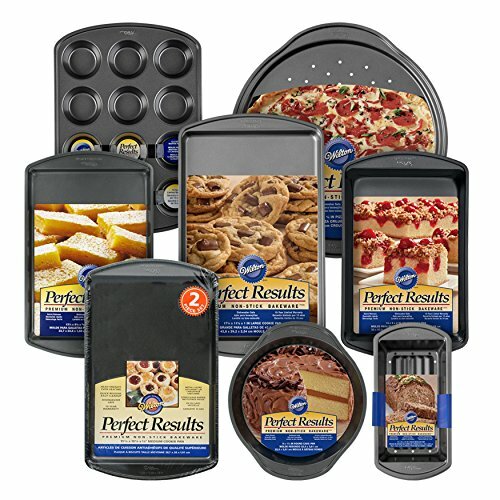 We've got you with this deluxe bakeware set that has anything you need to bake every day of the week. It includes 13.25 x 9.25, 15 x 10 and 17.25 x 11.5-inch cookie sheets, 13 x 9-inch oblong pan, 9-inch round cake pan, 12-cup muffin pan, 2-piece meatloaf pan set and a 14-inch pizza crisper pan. Each pan is made of steel and has a non-stick surface for easy food release and quick cleanup; and the 2-part meatloaf pan has a ridged surface and holes around the perimeter so that grease drains into the bottom. All have a limited 10-year warranty and are dishwasher safe, too. In order to help cut down on extra packaging waste, each individual product in your set will arrive together in the same plain brown box.